Hi thank you for trying our game and sorry for the late reply. At this point we are not going to get rid of any puzzles, we will try polish them to make them clearer and add a hint system. We want to add more puzzles too that would possibly support a thought process what some of the puzzles require. Also we think the inventory gets in the way of the puzzles, so we will do big changes to it too. Thank you for your feedback, we will watch the video too and add it to our public playlist. With all the issues you pointed out, we are aware but unfortunately we couldn't find a fix soon enough before the release. We think the error issue at the beginning has something to do with the cutscene but we aren't sure. The puzzles need a lot of work, we thought of a hint system so that even if you don't know what to do, the hint system would help. Also many people thought that since there is a inventory, you are supposed to use those items in the puzzles. We want to fix that too with changing inventory into journal system. The save option will be added too, most of the things that weren't included were because we ran out of time and most of the time we didn't know 100% what to do. Thank you so much for your time, we value your feedback and will take notes about this and try to improve our game. Kiara is a unique suspense adventure/puzzle game with strong emphasis on story. 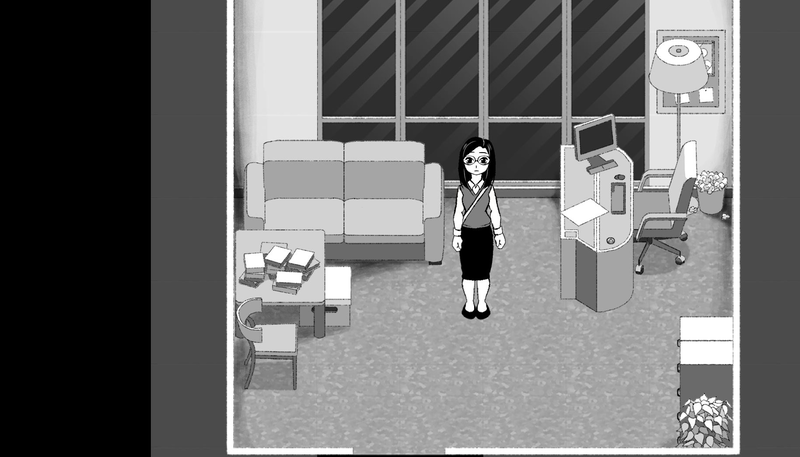 You play as Mina, a young woman who gets trapped in another dimension after her elevator ride goes awry. In exchange of her freedom, she must help trapped souls by piecing together their past from manifested objects. If you enjoy mystery and detective games, we think you might like Kiara. A team member had this idea of a game that is inspired of the urban legend “elevator game”. The entire team started to build a story around that idea and then our writer started to write all our thoughts into one solid concept. As we started to plan a horror game, we gathered some inspiration for art from Junji Ito’s manga, Parasite Eve, Clock tower, Pan’s Labyrinth and Crimson peak just to name a few. We wanted to create more creepy atmosphere and make the player feel uneasy. Being alone in a place that doesn’t make sense makes most of us feel unease. We decided to go with grayscale after the artists played around with the idea and the entire team liked the outcome. 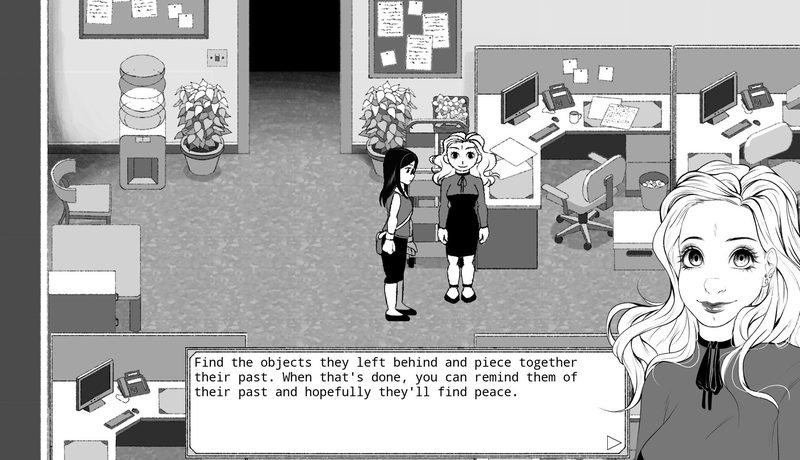 Also, we really wanted to try creating a game that felt or looked like a manga. We are aware that the first puzzle ended up being too hard, this will be fixed as soon as we're allowed to make patch the demo and have more time. Lots of stuff had to be cut due to time constraints, those will be added too. We're very happy of the setting and how it gives us nearly unlimited possibilities to tell stories all while keeping the core of the urban legend intact. We haven't decided how many "floors" (levels) this game will have but it will be multiple. We plan to add gameplay that happens before the demo to flesh out the story better and there will be a lot of variation to puzzles. We can't wait to tell the rest of Kiara. So far the feedback we've got has been very positive with people wanting more. We've written down everything that has been pointed out or critiqued. Hearing your feedback helps us to learn more and we value the time you have spent to play our game and sharing your thoughts, thank you. If you cannot play the game but want to know what is it about, we have gathered a playlist on youtube. Thank you for playing and sharing your thoughts. You did amazing job at voice acting! Thank you so much. Thank you for playing and leaving us feedback, we appreciate it! We hope to finish this game in the future with more story to explore and more polish. We have received multiple messages about the video, we had some issues with it while developing but unfortunately our code wizard ran out of time and couldn't figure out the solution. This and many other bugs will be hopefully fixed for the future release. And yes, the keypad puzzle is pretty hard, our team couldn't decide on it if it was too hard or easy to solve. Some of our friends and team members found it easy and some difficult to understand. But we will change it and possibly add a hint system to help, so players wouldn't need to check walkthrough. We know how annoying that can be. The shadow was added (maybe a bit too dark though) so that it would be easier to separate which leg is front and which is back since their skirts can make it confusing. Thanks for trying our game! We tried to fit a lot of the important things in the beginning, but our writer realized it was a bit too much and he will change it for the future release. We will share your video on twitter soon, thank you for sharing your experience and thoughts with us. Thank you for playing our game! We would love to finish this game since we have so many plans and ideas for it. With the puzzles we are testing what works and what doesn't so getting feedback about them helps. We will watch your video, like we watch most of the let's plays so we can see the reactions but also to hear feedback. Thank you for your feedback. We appreciate that you played our game and wrote for us. The way we approached this competition was to create some of the parts we would like to include in the full game, not maybe as they are right now but just to show the potential. We are going to do major changes in the future for the game. Unfortunately we ran out of time and couldn't do some of the changes we really wanted to for this version. With the puzzles we took a risk, we didn't have time to gather people to test them out before the release and couldn't decide if they were too hard (for the wrong reasons) or too easy that can be seen as a negative thing too. And that is why we value the feedback so we can see how to improve these puzzles we had the idea for. The Inventory will be changed for the upcoming versions since we had other idea for it, but again, ran out of time. Since this is going to be story heavy, it is guaranteed that there is other things to explore on the side. We have received few messages about the start not working properly. Unfortunately time was running out and we couldn't figure out the issue fast enough. We decided to use the Continue button, to skip some of the beginning so that if the game crashed you didn't need to look the cutscenes again and again. We couldn't decide if the first puzzle was too hard or not, we didn't want to make it too easy either. Good thing we can test what type of puzzles works for bigger audience. We hope you enjoy the rest of the game, again, thanks for the feedback. Thank you for your feedback! We would love to finish this since we have so many plans for it.